Figure 1. Single-crystal CVD diamond. Courtesy of Element Six. 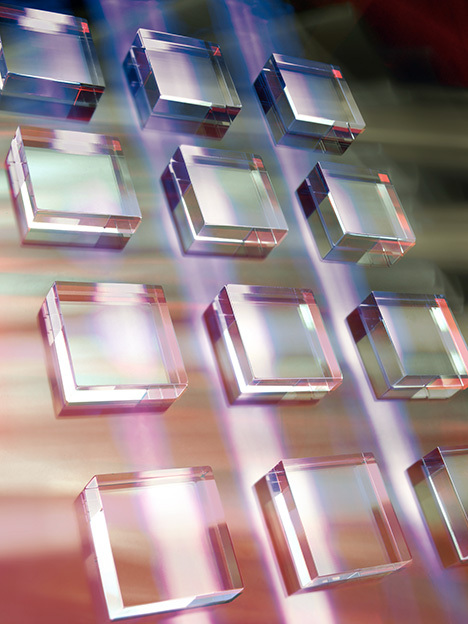 Element Six first started its chemical vapor deposition (CVD) synthetic diamond program in 1988. Thirty years on, this talk will review notable high and low points, flagging some lessons learned. Volume synthesis of diamond by CVD (figure 1) has not only contributed to reducing the cost of the material but also enabled the superlative properties of diamond to be more fully utilized. It has long been recognized that, aside from its extreme hardness, dia­mond is a remarkable material with many properties—optical, thermal, electrochemical, chemical, and electronic—that outclass competing materials. When combined, these properties offer the designer an engineering material with tremendous potential to create solutions that can shift performance to new levels or enable completely new approaches to challenging problems. Components routinely fabricated using CVD synthetic diamond now span tweeters for loudspeakers, radiation detectors and sensors, optical components for lasers, windows for radio frequency and microwave transmission, blades and cutting tools, and electrodes for electrochemical sensing, ozone generation, and direct oxidation of organic matter. Lightbox, a new De Beers company, has recently announced jewelry using white, blue, and pink lab-grown CVD diamonds. As crystal growers and materials scientists know, intrinsic undoped diamond is colorless in the visible range, but its absorption properties can be modified by defects, often referred to as “color centers,” formed either during the CVD growth process or through post-growth treatments such as irradiation and annealing. This presentation briefly summarizes some of the tools used to engineer CVD diamond. For example, controlling the nitrogen level (yellow CVD) to obtain particular thermal and optical properties, doping with boron (blue) to make electrically conducting diamond used to produce ozone for sanitization and for thermal management in telecommunications, and growing in nitrogen-vacancy centers (pink) to make magnetic sensors. The diverse applications of diamond that harness its exceptional properties and the impact of color centers touch our lives in unexpected ways: Diamond is used to create the high-quality mirror finish on your smartphone and to produce the 170 miles of copper wiring in the aircraft that takes you on vacation, and it is also enables new higher-power lasers used in welding our cars together. It is even used in the quality control of food and in pharmaceutical manufacturing. In summary, there has been considerable progress in the fabrication and commercialization of CVD-grown diamond over the last 10 years by a number of producers. This progress, coupled with the broad range of applications, shows that perhaps a new age of industrial diamond has truly begun—the age of CVD synthetic diamond. Many gemologists know that there are important technological applications for laboratory-grown diamonds; however, it is less understood how broad the nongemological uses really are or why diamond is the ideal material for each use. This presentation will review modern industrial applications of laboratory-grown diamonds, including surgical tools, tumor detection, orthopedic implants, water purification, industrial tooling, compound refractive energy focusing, Fresnel lenses, high-pressure anvils (figure 1), sound reproduction, deep space communication, high-power electronics, quantum computing, long-term data storage, AC/DC conversion, and electrical vehicle efficiency. Figure 1. Laboratory-grown diamond anvils, capable of generating 1 terapascal of pressure, enable high-pressure experiments for physics, chemistry, materials science, and industry. Photo courtesy of New Diamond Technology. These applications are rooted in the less frequently discussed gemological properties of diamonds that make it a “supermaterial.” The biological, thermal, mechanical, optical, acoustic, and electrochemical properties of diamond will be introduced. Specific properties discussed will include thermal conductivity, Young’s modulus, breakdown field, band gap, and saturated electron drift velocity. Furthermore, the utility of diamond defects such as nitrogen vacancies and boron will be explored. In addition to discussions about functional monocrystal diamonds, two unnatural forms of functional diamond will be discussed: polycrystalline diamond (PCD) and diamond-like carbon (DLC). Many of the functional diamonds discussed, including PCD and DLC, will be available for hands-on examination as part of the presentation. Big-data analytics is the process of collecting, organizing, and analyzing large volumes of data to reveal hidden patterns and unfamiliar correlations, identify market trends, and extract other useful information that might otherwise be invisible—even for the data manager. Big-data analytics is seldom used within the gem and jewelry trade. The gem and jewelry sector is kept with general fixed inquiries that block the category from characterizing its inventory and users, and by that, identifying new opportunities. Another challenge is that in most online marketplaces, the “What You See Is What You Get” experience is hindered by two main factors: improper disclosure and misrepresentation of images (e.g., digitally enhanced photos). 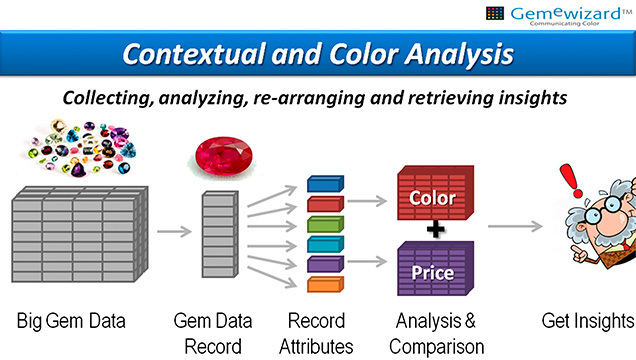 The research and development team of Gemewizard has devised and digitized a fully automatic big-data analysis system for large-scale gem and jewelry marketplaces, based on color and contextual search engine and image analysis (figure 1). This system generates unique market analytics and a fraud detection and prevention service. Figure 1. The system algorithm crawls the HTML pages of gem websites for big data. For each gem, it condenses the item page to its attribute components and records useful data. The collected data is then compared against the entire database to identify insights and peculiarities. Since 2016, the Gemewizard team has had the opportunity to examine the validity of the system using vast amounts of data from a world-leading online retail marketplace. The information gathered from this survey, together with additional volumes of information collected from the Internet, provided some important insights regarding the online gem and jewelry trade. Some of these insights, which we consider fruitful and eye-opening for any marketplace or e-tailer, will be revealed. Gem type: Mineralogical, gemological, and trade names, as well as misnomers. Analysis includes accepted word combinations (e.g., “ruby” and “zoisite”) versus problematic ones (e.g., “diamond” and “moissanite”). The trade-related information provides powerful forecasting tools for the marketplace administrator. These include sales and trends history, defined by attributes such as type, color, geography, seasonality, and price, and the ability to identify tendencies (e.g., “Prices of untreated ruby gems between 2 and 3 carats are on the rise in Europe…”) and pricing opportunities (e.g., “Currently, there is a high demand for pale-colored Paraíba tourmaline gems in Far East markets”). People are impressed with the uniqueness of diamond, which incorporates factors such as brilliance and fire. When the trade commoditized the category through the Four Cs, it was partly due to the technical inability to promote diamond’s impressive optical effects, including optical illusions. This common trade practice inhibited diamond’s competitiveness against other goods in the luxury sector. But from now on, emerging technology will allow demonstration of diamond’s magic on a large scale with fine details. Modern algorithmic craftsmanship creates the category of high-vibrancy diamonds, referred to here as Hi-Vi: exceptional diamonds with superior consumer benefits such as brilliance, fire, table color, symmetry, and spread, compared to others of the same shape, size, and pavilion color. The triple excellent round, which took centuries for the industry to craft, was the first Hi-Vi diamond. Diamond vibrancy is a combination of optical effects and illusions. For example, brilliance, fire, scintillation, and spread depend on both objective parameters such as cut design and stone size, as well as subjective aspects of human vision, such as space-temporal sensitivity and stereo perception. Figure 1A demonstrates the scintillating grid illusion: The intersections seem to flicker white and black, generating additional brightness and contrast when the observer’s glance wanders. Distortion of pattern ruins this effect (figure 1B). Certain patterns produce higher perceived brightness. This example is a 2D effect; more astonishing optical illusions result from human stereo vision. Figure 1. 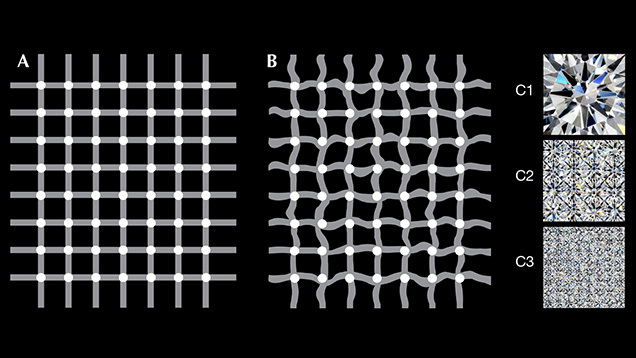 A scintillation grid (A), a scintillation grid with a wavy pattern (B), and squares covered by round brilliant-cut diamonds in different sizes (C). The phenomenon of diamond brilliance has a similar origin—human vision peculiarity—as the scintillating grid illusion described above. The impact of optical illusions on both Hi-Vi diamond patterns and jewelry designs (e.g., melee) are to be considered, so Hi-Vi optimization is made for not just single diamond cuts, but also for each diamond jewelry piece as a whole. Figure 1C shows squares with round brilliant-cut (RBC) patterns that differ only in size. The integral colored and colorless areas are exactly the same, while the perceptions of fire and brilliance in each image are quite different. It is impossible to maximize two performance parameters (both fire and brilliance, for example) simultaneously. The consumer’s final choice should be based on subjective preferences and rely on performance benchmarks. Hi-Vi diamonds should be demonstrated with an optical performance digital “loupe,” which allows even inexperienced buyers to easily appreciate the performance difference at the highest levels of brilliance, fire, and scintillation. 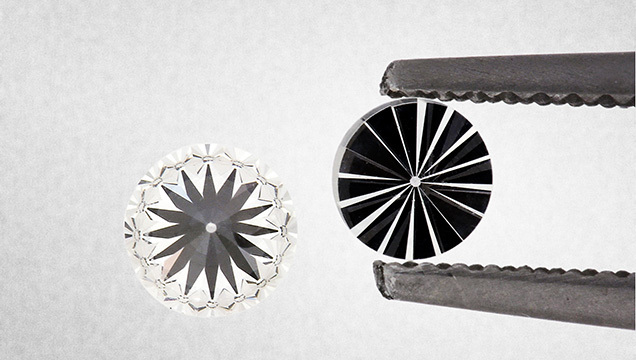 The “loupe” is critically important for mass marketing of relatively small diamonds. For sustainable market development, diamond impressiveness and vibrancy born of masterly designed optical illusions and visual effects is the selling proposition to craft, demonstrate, and explain.